It’s a well-known fact that a majority of projects across the world do not reach their successful closure as reported by PMI (Project Management Institute). According to the project management experts, the most common reason behind this frequent failure of projects is inadequate project management practices, impractical process and limited project management skills with most organizations. Based on the understanding of requirements, we plan the project incorporating all the vital aspects of your project, such as stakeholders’ expectations, budget and resources, scope, risk, tasks and responsibilities, communication planning, timeline and the quality. Based on the estimates, we create baselines that help us create project schedules, such as cost, activities and work packages, resources and risk. We make use of PERT (Program Evaluation & Review Technique) to create the optimum schedules and are also able to fast-track or crash the projects as per the situation. 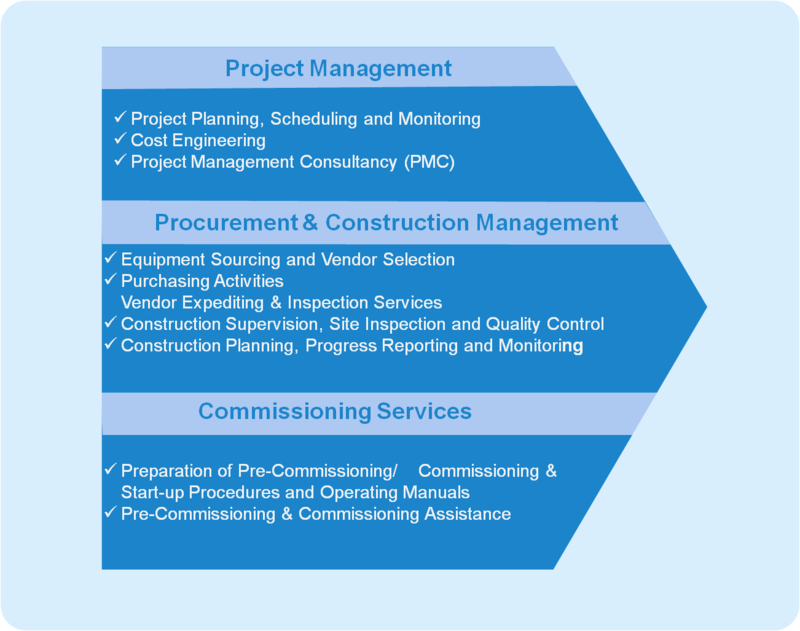 Considering cost as the focal point of any project, we perform various cost engineering activities, such as identification and optimization of cost-centric activities, cost estimation using standard estimation techniques, optimum resource scheduling, and cost control during project execution. In order to optimize costs, we are able to introduce our services during contract negotiations, vendor management, procurement, technology evaluation, and risk identification. Overall, the goal of our cost engineering services is be best able to predict or assess cost, minimise the risk and impact of overspends against budgets, and to ensure that there is an appropriate balance between technical aspects and the related costs. For a successful project execution, procurement and acquisition of resources may require additional expertise and may be a time-consuming activity. This is why we help you on various aspects related to procurement, such as equipment sourcing and vendor selection, vendor expediting and inspection services and other purchasing activities. We following standard processes related to equipment and material identification and analyse them on the basis of cost and benefits. Also, we perform activities like, sending RFIs and RFPs, quotation invitations, vendor short-listing, contract negotiations and ensuring timely deliveries. We also step in during the project execution to expedite supplies and inspect the quality of their services and products to avoid any quality shortcomings. In any construction project, aspects related to quality control and measuring progress require a deep understanding of the construction business. We, at GTS, offer our services to ensure the quality of your construction projects with our services, including construction supervision, regular site inspections, monitoring of the quality and progress, and quality control. We also help you during the planning phase of your construction project and keep a check on the quality and speed with our progress reporting and monitoring services. In any project, commissioning of the procured equipments and material supplies is crucial for a successful execution or construction phase of a project. Our project management consultants and commissioning engineers take up the responsibilities of supporting and supervising the commissioning activities. These activities include performing evaluation/trial runs, conducting equipment reviews, creating commissioning strategy documents, creating and performing test procedures, ensuring adherence to safety practices, investigating and troubleshooting issues. If required, they also conduct trainings to the maintenance and operative staff. Our commissioning engineers and project management consultants collaborate with our customers and their project engineers to ensure safe and cost-effective commissioning activities.